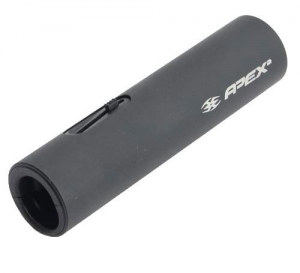 This APEX2 Thread On Barrel is compatible with all Raptor Tactical Rifled Barrels, Tactical Barrels, Spyder MR1, MR2, MR3 7/8th inch Recon Barrels, and 1 inch Recon Barrels. This is a thread-on APEX barrel you can attach to the tip of the RAPTOR and RECON rifled barrel. Now you have the power, the distant, the accuracy and the performance of a rifled barrel with the ability of the Tippmann Flatline Barrel. With the APEX2 and RAPTOR / RECON rifled barrel combination you are guaranteed to get more distant, accuracy and more elimination than ever before. Here is how it works. The APEX2 barrel has an adjusting switch that allows you to control how much curve to put on the ball. You can turn the APEX2 barrel to curve up, down, left or right. This allows you to have full control where the ball will land. With the APEX2 barrel you will able to shoot around an object at a curve to take out your opponent. The APEX2 Barrel has again redefined how paintball is played. The new stealth look of the APEX2 Barrel will provide you with unmatched distance and accuracy enabling you to hit targets that you thought were unhittable before. The adjustable ramp switch now comes with 9 levels of control to customize your level of curve and spin, from no spin to unbelievable. 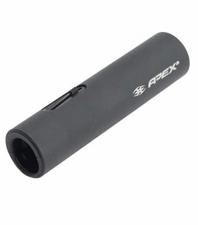 The APEX2 also allows you to disassemble the barrel without tools for easy maintenance. The APEX2 like the original APEX barrel can still produce long ball distance shots, shots that �drop down from the heavens�, left and right curve balls, and with its re-designed internal section allow for longerflatter trajectory shots with the twist of the barrel. Opponents can run but can�t hide with the new APEX2 from Empire Battle Tested. APEX BARREL FEATURES Get the shot!